1. On September 30, 1880, Pope Leo XIII by his Encyclcial Letter, “Grande Munus,” extended the veneration of the Apostles of the Slavs, SS. Cyril and Methodius, to the entire Catholic Church. This action on the part of the Supreme Pontiff meant the recogn ition of the important contribution of the Slavic Apostles in shaping the destiny of the whole of Europe and call ing to unity the Eastern and Western Churches. 2. The papal confirmation of the use of the Slavic language in the Liturgy had far reaching consequences for all the Slavic peoples. First of all, SS. Cyril and Methodius had to devise a Slavic alphabet for them which became the basis of their cultural development. Using the then Slavic language in their translations of the liturgical books, the Holy Brothers necessarily shaped a literary language for the Slavs. And by establishing Slavic missionary schools they laid the foundation of a formal education among the Slavic peoples. 3. The European civilization, which incorrectly was called the “Western Civilization,” was gradually transplanted by the immigrants, during the last two centuries, to the United States. And yet this ” Western Civilization” is a result of the interaction of two main Christian currents, Roman and Byzantine, both making their important and complementary contribution to its formation. The Roman, which was salvaged from its complete destruction by Western Christianity; and the Greek culture, which was ennobled and extended into Europe by Byzantine Christianity. Pope John Paul II, proclaiming SS. Cyril and Methodius Co-Patrons of Europe, wished to link their missionary and cultural work to that of St. Benedict in order to underscore their common contribution to the spiritual, cultural and civic life of the European peoples. It was only at the turn of the 18th century, during the so-called “Age of Reason,” that the important contribution of the Apostles of the Slavs to the formation of ” Western Civilization” was minimized or completely ignored by the Western world. Pope Leo XIII who, by his encyclical ” Grande Munus” in 1880, brought back the figures of SS. Cyril and Methodius, as well as their merits, from oblivion, and pointed out the importance of their apostolic activity in Central Europe. In favor of this proposition, there are many historical proofs which belong both to the present and to the past. And they all find their justification in the history of the European nations. “0 SS. Cyril and Methodius, who with admirable dedication brought the faith to the Slavic peoples, thirsty for truth and light, let the entire Church always proclaim the crucified and risen Christ, the Redeemer of mankind! “0 SS. 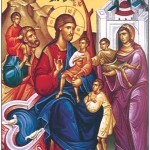 Cyril and Methodius, who during your difficult misSionary work always remained deeply attached to the Church of Constantinople and to the Roman See of St. Peter, bring it about that these two sister Churches, having overcome the plight of division in charity and truth, may soon reach the so desired full union! “0 SS. 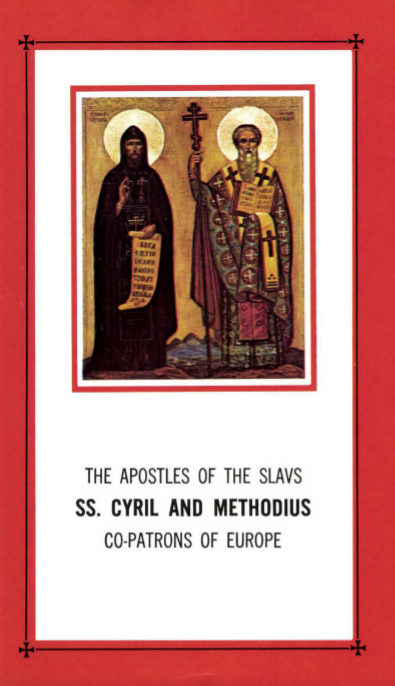 Cyril and Methodius, who with the spirit of brotherhood approached various peoples to bring to all the message of universal love preached by Christ, bring it about that the peoples of Europe, aware of their common Christian heritage, may live in mutual respect and solidarity, and be peacemakers among all the nations of the world! The above prayer was composed by His Holiness, Pope John Paul II , on the occasion of proclamation of SS. Cyril and Methodius as CoPatrons of Europe and was recited by the Supreme Pontiff for the first time (during the festivities on February 14, 1981) in the Basilica of St. Clement where St. Cyril is buried. 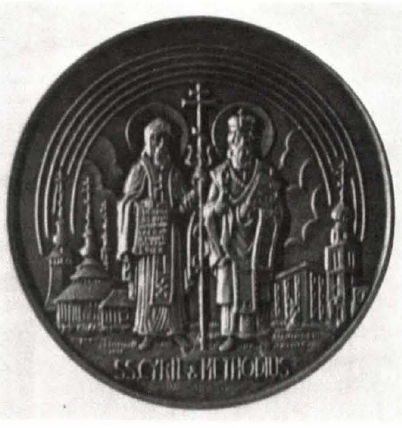 Picture of the commemorative medal struck to mark the establishment of the Byzantine Ruthenian Metropolitan Province, June 11 , 1969.
o SS. Cyril and Methodius, inspired by God, you became equal to the Apostles and the Teachers of Slavic lands. Intercede, therefore, with the Master of the whole universe that He strengthen all Slavic peoples in true faith and mutual understanding, grant peace to the world and save our souls. Let us praise our two Holy Teachers who, by translation of the Holy Scriptures, gave us a fountain of the knowledge of God, from which we continually draw abundant learning. We exalt you, therefore, 0 SS. Cyril and Methodius, as you stand before the throne of the Most High, fervently interceding for the salvation of our souls.